Breathing deep, I notice myself responding to uncertainty. I notice some fears. As the Moon wanes from a dynamic Valentine’s Day fullness, many of us may be wondering about change, both the fears and joys attached to it. I am noticing that the more change is present, the more I need to feel certain, at least about some things. Certainty can be a comfort, an anchor, in uncertain times, and it can be a dogmatic attachment to my point of view. Too much certainty becomes toxic. I wonder what would happen if I could gently release my attachment to certainty? Can I treat this part of myself with more compassion? Paradigms are shifting, causing many of us to notice ingrained responses to uncertainty. What I am noticing about myself is a desire to find sure footing. I turn to my trusty dictionary and online etymology site to dig deeper into the word: Certainty means firm conviction, it is from the Latin, certus, meaning sure, fixed, settled, determined. Originally a variant past participle of cernere meaning "to distinguish, decide," literally "to sift, separate" [From www.etymonline.com]. My attention is piqued by the word ‘fixed’ since the sign of the current lunar cycle*, Aquarius, is fixed air. Fixity can be a gift and a challenge. This lunar cycle calls attention to paradoxical Aquarian qualities: being the instigator of change while at the same time fixing on ideas in response to the uncertainties that change brings. A somewhat hilarious component to this dynamic tension between certainty and change is that Mercury is moving retrograde through Aquarius right now. Mercury, aka Hermes the Trickster god, has a prime mission to point out the ways human attachment to thought, systems, and rationality are but tenuous dreams created to give us false certainty. Are you laughing yet? Mercury makes two important connections this week, a trine to Mars and a square to Saturn. Since Mercury is moving backwards, this is the second time Mercury has formed these aspects in recent weeks. When Mercury turns direct, it will come back for the third and final time. We are mid-conversation. The Mars contact reminds us of the speed of thought and word. How do we develop more mindfulness? The Saturn contact tells us that our words and thoughts carry significance and weight—how do we use these tools with responsibility for their impact? In this season of fixed air (Aquarius) it is good to notice the desire for certainty. When the Sun shifts into Pisces this week, we become much more attuned to our common feelings, becoming ever more aware that fixity is impossible as we sense into that ocean. 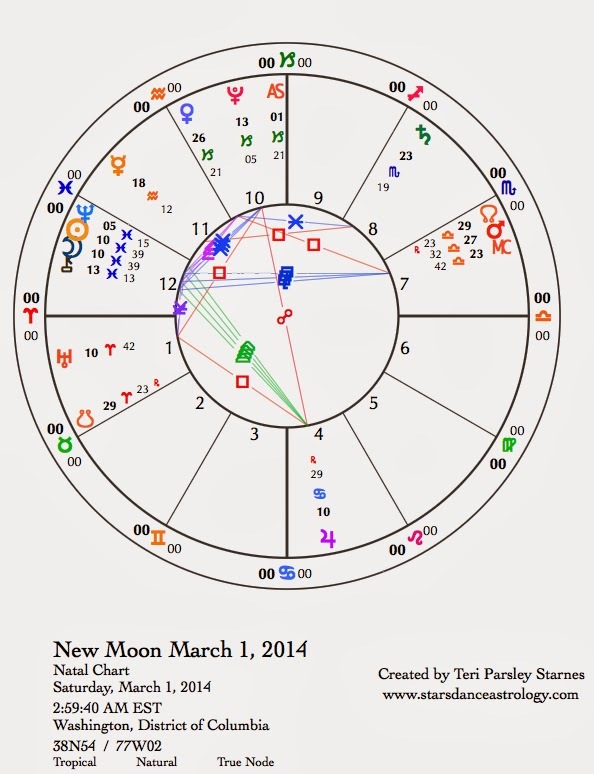 Not until the next New Moon, on March 1, do we set mindful intention around this Pisces mission. For now, we dismantle the Aquarian approach: sorting, discerning and sifting through what is and isn’t beneficial to meet the challenges of change. Sunday, February 16. Communication is primary for moving our visions forward. Mercury (retrograde) is forming a harmonious trine with Mars in Libra. In air signs, this transit speeds up thought and action. The tricksterish quality of Mercury at this time may play tricks on our assumptions, however. Is faster always better? The Moon makes favorable contacts with Pluto, Venus, and Saturn. We can take advantage of this energy to have deeper conversations that get to the heart of the matter. Monday, February 17. The morning may be a little sleepy. A good way to get the day started could be to use the Virgo Moon energy of the morning to integrate body and mind. Perhaps a meditation practice, exercise, or starting a new holistic diet would help you feel more prepared for the week ahead. Notice any tendencies towards self-judgment. What are your strategies for balance? 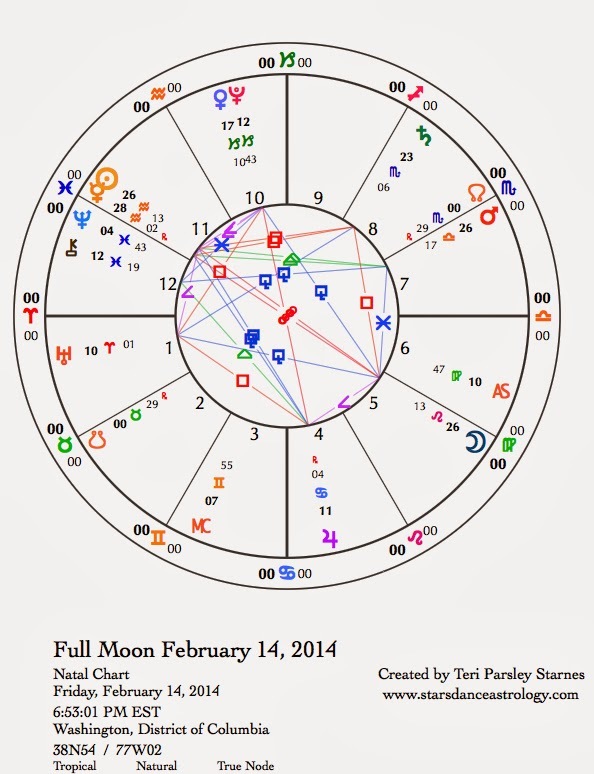 February 18—Disseminating Moon: Sharing. Take it easy on yourself. Expectations or demands on our attention could be high today. This phase of the Moon invites a practice of gratitude. No matter how much better we could be, right now, each of us is good enough. Share that spacious self-acceptance in a practice of gratitude for what you are learning. The Moon in cardinal air sign, Libra, sparks the paradigm-questioning configuration of planets—Uranus in Aries, Jupiter in Cancer, Pluto in Capricorn, and Venus in Capricorn. The Moon’s essential desire in Libra is to find balance and partnership. We may notice a real need for these qualities today. We may also notice how our lives may be out of balance or our relationships not perfectly aligned with the changes we need to make. The dynamic tension can teach us how to navigate through change. [Read this week’s introduction about certainty.] There is always another way to come at your challenges. What are your second thoughts? By this I don’t mean your doubts, but what thoughts come next after your first thoughts? As Mercury (retrograde) squares Saturn, we have a perfect opportunity to cultivate the practice of second thoughts. Other big, yet subtle, shifts occur today. The Sun moves into mutable water sign—Pisces. Although it may feel like winter still has a strong hold on your weather, depending on where you live, the Pisces season signals the thawing of hard forms. Get ready to flow into spring, into change, into life. The signs of the Moon’s Nodes are moving to a new pair of signs—North Node in Libra and South Node in Aries. For the next 20 months, the growing edge centers around the opposition between partnership/balance and individuation/action. We will be learning new ways to integrate these seemingly opposing impulses. Wednesday, February 19. Mental functions are stimulated this morning (CST). The Moon trines retrograde Mercury and forms a conjunction with Mars. It is up to you to decide whether you want to move forward with your new ideas or just sit with them for a bit longer. Both courses of action have their benefit. Since Mercury is moving retrograde, we just can’t expect to know how these things will turn out. Don’t be surprised if you have to redo something later. If you are OK with that, then go ahead and take action now. Later in the day, we feel emotional resonance. As the Moon and Sun—both in water signs—form a trine to each other; go with your flow. Thursday, February 20. After a crusty winter, what gifts does water offer you? Take advantage of the Moon in Scorpio making a grand water trine pattern with Neptune and Jupiter through the course of this day to deeply appreciate the delight and mystery of water. I don’t think I need to point out the possibilities. Today, they are hard to ignore. Friday, February 21. It may be good to check back in with our need for certainty and security today. With the Moon in fixed water contacting Mercury in fixed air and Saturn also in fixed water, we have the opportunity to notice the dynamic tension between intellectual certainty and emotional certainty. Saturn helps us to take responsibility for our impact. This is a day to build more authority through commitment. February 22—Last Quarter Moon: Evaluating. At the New Moon, I wrote: “The work of this lunar cycle is to make Aquarius vision more effective through connection to our tender hearts of emotion while planting our feet firmly on the ground of sustainability.” In this phase of the Moon, we evaluate the experience of the lunar cycle. Change, compassion, flexibility, and grounded structures were important ingredients. What do you notice about your own experience? The metaphor that resonates for me at this stage of the cycle is the seed of knowledge formed from our intentions and experiences of this cycle. What is your kernel of wisdom concerning vision and change? The Moon in Sagittarius encourages truth seeking and story telling. Take this time to weave a story of meaning. It may be ephemeral truth, not lasting for very long. But notice the desire to create story and meaning from experiences of this month. Poetic, ecstatic forms may serve better to express your story. With the Moon squaring Neptune, we may long to connect with universal stories only to find that each of our experiences is quite unique. Enjoy the process of expression more than the product you are creating. The firey Moon trines Uranus tonight (CST), it feels good to expand our horizons.